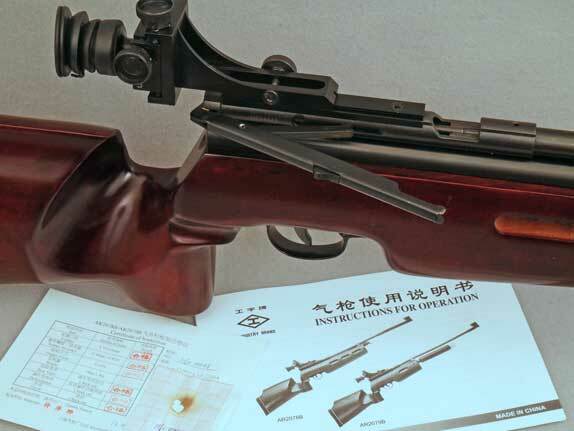 Archer on Airguns: AR2078B and AR2079B Both Now in Stock. Now in stock again at Archer Airguns is the very rare AR2078B - the sidelever cocking, competition version of the popular AR2078A CO2-powered target air rifle that uses 2 x 12 gram Powerlets to propel the pellets for about 60 shots from one fill. The AR2078B scores with its easy cocking and accuracy. A factory test target and quality inspection sheet is included with every gun - as is shown in the photograph above. Also available at Archer Airguns - for the first time - is the AR2079B model. Even more rare than the AR2078B, the AR2079B is a very similar CO2-powered target rifle with sidelever cocking. But it is designed to be used with either 9-ounce paintball tanks or 88 gram AirSource tanks - both require an adapter that is also for sale in our store. Using these larger CO2 supplies increases the number of shots per fill into the hundreds and also gives somewhat more consistent muzzle velocities due to the greater volume of CO2 stored in these tanks. Very limited quantities are available.